Why do multisite church? Why should your church spend the time, effort and expense to launch new campuses in new locations? I want to share three key reasons, based on our church’s experience, why you should seriously consider using a multisite strategy. We began our multisite journey motivated by two facts. First, we learned that other churches were using multisite as an effective strategy to launch new congregations. Many people who do not want to be senior pastors or church planters have the necessary skills to be great campus pastors. So by adopting a multisite approach a greater pool of leaders is available to launch new Jesus-centered faith communities. we could see that we were increasing drawing people from further away but that these people were believers that were not engaging in meaningful, life-changing ways. We realized that if we were going to reach unbelievers in the communities outside our immediate vicinity we need to start new congregations in these outlying towns. In the last four years we have launched four new campuses in outlying, nearby counties. Besides adding over seven hundred new people to our church, here have been the key results. There has been a dramatic mobilization of new leaders. Every time we launch a new campus we must recruit, train, and release a platoon of new leaders. We need new small group leaders, worship teams, kids and youth ministry leaders, a welcome team, etc. People who were passive or moderately involved in our large original campus must step up to the plate and commit themselves to ministry and to the Lord in deeper ways to help start new congregation in their town. There has been a significant increase in the quality of our church. Besides increased attendance and leadership, we have been surprised at how implementing a multisite strategy has improved the quality of our church life. The percent of people involved in small groups and the percent serving in ministries have gone up. Our Natural Church Development health scores have gone up an average of 6 points—from 71 to 77. Also, when we ask our members in our annual survey to rate the quality of our ministries in the areas of sermons, worship, small groups, children and youth, all of these measures are rated higher at the newer campuses that at our larger, original campus. Most Sundays the sermon at our newer campuses is delivered by video. I find it fascinating that those watching the messages via video rate their quality slightly higher than those who hear it in person. Finally, the most important reason to use a multisite strategy is to accelerate evangelism. Before we started using a multisite strategy, 24% of the people attending our services reported that they were not involved in a church previously to coming to our church. Since starting new campuses the percentage of worship service attenders saying that they were previously unchurched has risen to 28%. At our original campus the percentage is now 27% while at newer campuses the numbers are 35%, 31%, and 32%. (We have yet to do a survey at our fourth new campus which was just launched last month.) Besides the 28% who say that they did not have a previous church home, another 25% say that they had a church but they were not actively involved in it. So a total of 53% of our attenders were not actively involved in a church before coming to our services. 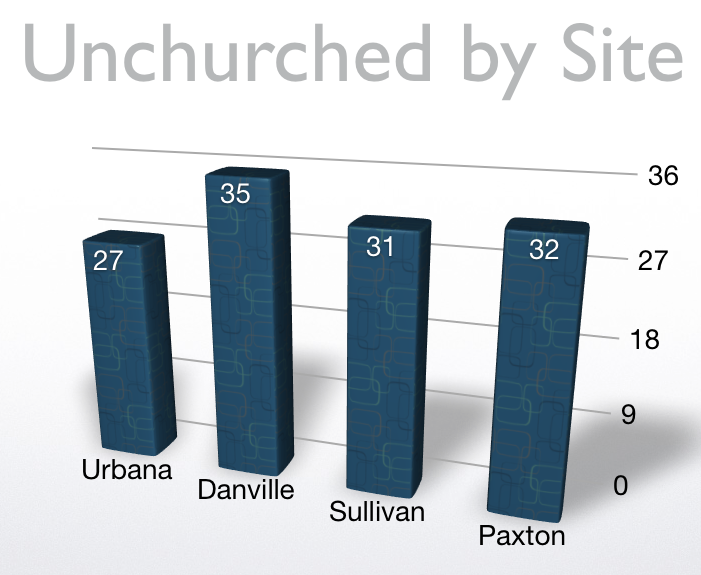 Our goal is not to reach members of other churches but to reach the unchurched and dechurched, and our research shows that is in fact what is happening. Starting new campuses does not replace church planting. While we launched four new campuses in the last four years, we also sent out two church planting teams. Church planting and starting new campuses are two different ways of launching new congregations to reach new people with the love, truth, and power of Jesus. What questions do you have about multisite church? How serious is your church about reaching new people and starting new churches? Is multisite a strategy you might want to consider in the years ahead? Why or why not?